A new study undertaken by First Nations and the Pacific Salmon Foundation has provided significant new insights into wild Pacific salmon along the Central Coast of British Columbia. 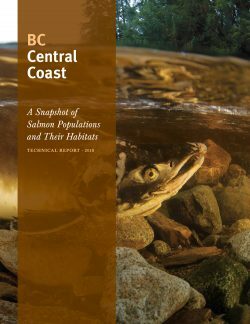 However, it also reveals that more information is needed to understand the complete situation for more than half of the 114 ecologically, geographically, and genetically distinct groups of wild salmon found on the Central Coast, including 62 of 84 sockeye populations. “The results of this project underscore the urgent need for long-term investment in salmon monitoring and assessment on the Central Coast, particularly for sockeye salmon that have little to no information for most populations,” said Katrina Connors, Director, Salmon Watersheds Program for the Pacific Salmon Foundation. Many of these sockeye populations utilize small coastal lakes that dot the outer coastal islands and inlets of the Central Coast. Their remote location makes them inherently difficult, and costly, to monitor. As a result, for the majority (approximately 70%) of sockeye, little is known about their current status or how it may be changing over time in response to environmental variability and human actions. Maintaining salmon biodiversity is a central tenet of the federal government’s Wild Salmon Policy (WSP). Through strategies that require the monitoring and assessment of all salmon species, the WSP provides a framework for protecting the genetic diversity among salmon populations that is essential to the long-term viability of these species and is the basis for future salmon production. Unfortunately, in recent decades, a lack of adequate funding has constrained monitoring and meant that only the largest, and most accessible, populations are monitored. This declining investment undermines the ability to evaluate the current state of salmon in this region, and to identify where conservation and management intervention may be required to support recovery of salmon production and sustain fisheries. This project continues the PSF’s investment in making ‘salmon data’ publicly accessible through the Pacific Salmon Explorer, an on-line data visualization platform. This platform provides the most comprehensive source of data for salmon production, state of their habitats, and trends in production over time. All of the data and assessment results are visualized and made freely available to the public. This project is the product of a 2-year collaboration between Central Coast First Nations including the Heiltsuk, Nuxalk, Kitasoo/Xai’xais, Wuikinuxv and Gitxaala, the Central Coast Indigenous Resource Alliance, Fisheries and Oceans Canada, the PSF’s Salmon Watersheds Program, and other regional salmon experts. The project collaborators were unified by a shared belief in the importance of good scientific information about salmon populations and their habitats and the role of this information in supporting evidence-based decision-making for wild Pacific salmon. New Data Visualization Tool – the Pacific Salmon Explorer!